Hi Friends: There is a new challenge today over at the Crafting When We Can Challenges Blog, where the current theme is No Square Cards. Please visit our fabulous sponsor this week, Julia Spiri, to see all of her wonderful products! 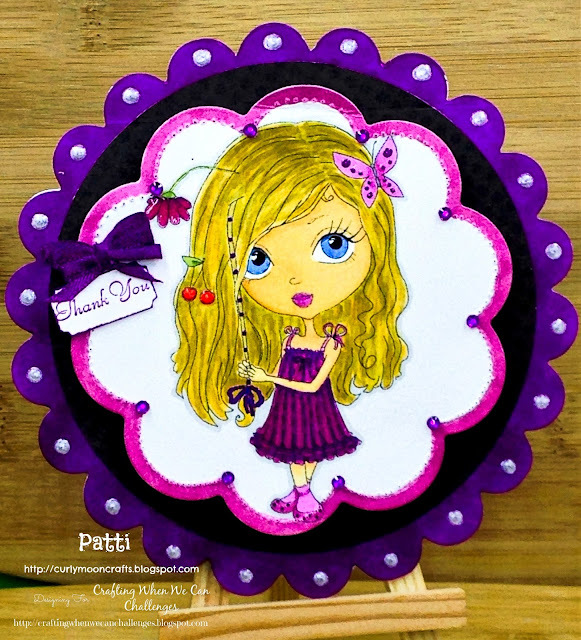 My creation for this week is a Thank You card using the Girl With Hair Wrap digital image. I printed the image onto smooth white cardstock and colored her with my Spectrum Noir markers (listed below). I die-cut the image using the Blossom Tags die set, colored the border edge, then used my piercer to put a stitched edge along the colored border. For dimension, I used Glossy Accents on the flower, butterfly, and cherries, then added some purple gems at the point of each scallop edge. I colored the edges of the scallop circle card with a matching SN marker, then added the pearl pen dots in each scallop. I cut a circle from the Stella and Rose dotted paper and glued it to the card center. I used foam dots to attach the focal image to the card. To finish, I colored some white ribbon with the SN markers and attached it above a stamped Thank You sentiment that was punched with a tag punch.